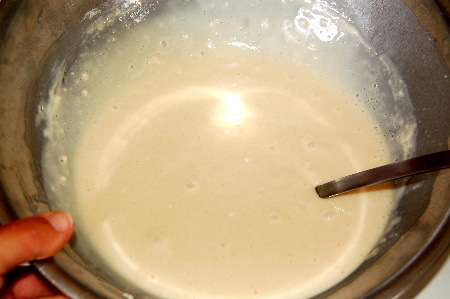 It’s that time of year again, and this is one of the most popular recipes in the Bayou Woman’s Recipe Box. Although we have a few more berry bushes than we did last year, they still have not recovered from the salty flood waters of Hurricane Ike, 2008. I didn’t have time to pick the few that ripened last week, but many of you are picking berries to your heart’s content, and I am as green about that as I can be. Since I can’t make my own cobbler, I’ll post this recipe again in hopes that all of you will make it and enjoy it for me. Then, please be kind enough to come back and tell us how you and your partakers enjoyed it. 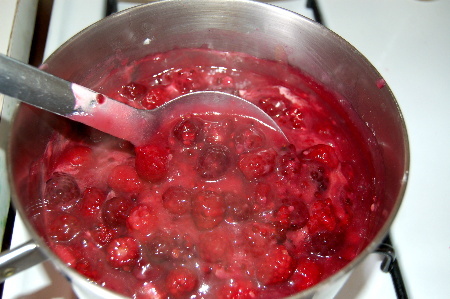 Serve warm with vanilla ice cream or whipped topping and garnish with fresh berries. This is a delicious spring dessert that does justice to these wonderfully tart berries. Enjoy! When I can “get me some” of those berries, I’m making it. When I lived in Kansas and Oklahoma, I always knew where to find plenty. Out here in dry West Texas I’ve only found rattlesnake eggs lately. 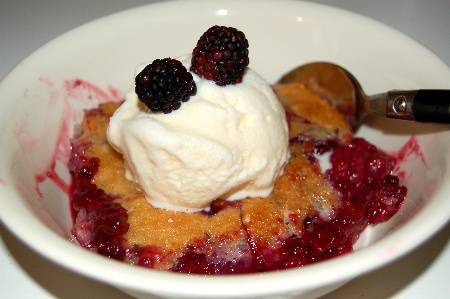 Blackberry cobbler is my absolute favorite food! I have a bag of berries in the freezer from last season that just may develop into this tonight!!!! Woo Hoo! Somebody’s making cobberler tonight!! Wish it was ME!!! gorgeous! and i’m very hungry right now. Wish i cold get that bowl out of my computer. Wow, that looks soooo good. I wish I had some this very minute! I’ve had my eye on 200′ of Dewberries that I CAN”T get to from my side of the ditch. I got permission just today (at a “Ribbon Cutting” ) from my former neighbors to go on their property to pick all I want. Now I’ve just got to find the time! Might just have to make some jelly too. Hey Steffi – I’ll trade you some frozen trout fillets for dewberries!!! Ive been watching the blooms and staking out where they are, guess I better go check and see if they are ready yet. Been waiting since you posted this last year, Im still salivating!! Sounds like a good trade Steffi, wish I was close enuff to barter with the BW, Im sure I’d be getting the better of the deal! I don’t have dewberries, yet, but I have blueberries in the freezer. I think I found my dessert for tonight! I have been looking for a good blackberry cobbler recipe for about a week. I have about 20 quart sized bags in my freezer that I have picked mostly myself doen here in Erath. Ike didn’t seem to affect these. I have not figured out the difference b/t blackberries & dewberries yet. I will be trying this recipe this weekend! Dewberries are earlier, more tart, smaller, and the leaf pattern and flowers are different from blackberries. If you do a search on this blog for dewberry/blackberry, you’ll see the posts and comments where we’ve discussed this at length. Good luck with your cobbler, and we’d love it if you have time to come back and let us know how you and yours like it! You’re welcome! Good luck, and I sure hope it goes well for you! I picked a couple of quarts of dewberrys today in about 20 minutes on the sde of the road here in Sugar Land Texas and I talked my wife into making me one of these cobblers tonite. 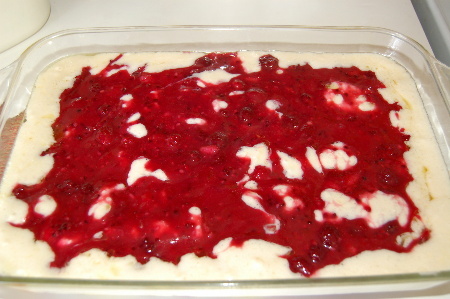 I know it will be good Its the best desert ever! Thanks for your recipe. It looks very similar to one she made a few years ago. We have an ice cream co. here in texas that makes a flavor called “Homemade Vanilla” ( Blue Bell). When you place a scoop of it atop this scrumdelicious dessert you have an absolute masterpiece. YUM I can already taste it! Wish I was there, Cindy! I missed them this year. So sad. The Police Jury cut and sprayed all 200 FEET of ditch bank about 3 weeks ago, wiping out this year’s crop! I’ll have to settle for Blueberry or canned cherries for cobbler this year. UNLESS…I can get Hubby to stop at our property in Mississippi on the way home tomorrow (gotta go to McComb-legal stuff). Anyway, I’m positive I could find some to pick. The whole 42 acres are fenced, and that fence line is bound to have some berries! Oh no, that is terrible! Did you get your Miss. berries? I hope so. Nope, we didn’t have time to stop. Today was kind of screwy. The only positive today, was eating at the Dinner Bell in McComb. Those things are solid along the railroad down here and it is only 6 blocks from my house! My mom lives 1 block from it 6 miles east of here and she and a couple of others are the only ones who picks them. I love the berries in cobblers but, the seeds get in my teeth and anyone with diverticulitis has to pass them by. S’ils n’ont plus de pain, qu’ils mangent de la brioche. Hey Diane! Who is out of bread? And what kind of cake is it? LOL! I think I’m gaining weight looking at the pictures of the cobbler. Mais, cher, you should have some nice berries up your way, no? LOL! Find some, pick them, and I’ll bake us a cobbler! Some kind of black berries grow in the rip rap near the infamous flounder hole. I am just saying. They’re all picked by now, Blu. Oh and my new raspberries are showing signs of life. This makes my mouth water! Can you believe the blackberries are not even close to being ripe here in St. Tammany Parish? Oh, yippee, Kim! So, when they ripen, I hope you are still there. Will you freeze me a quart? I’ll bake you a cobbler. I really will! It’s a deal if I can get some for you! I hope to get to your place again in a few weeks. Not sure how it will all fall into place. I have all that stuff for you.
. . . and they are opening the brown shrimp season this week coming . . . . we could spend the day breaking heads and putting up our shrimp in the freezer! I think if I pick a few more off of our back fence I will have enough to make this! I sure wish I could get to the other side of our fence, but there’s no gate! The berries on that side are bigger and sweeter because they get all of the sun! I scraped my fingers pretty good reaching through the chain link to get a few big ones! A quart is 4 cups, right? I don’t have a jar, but I do have a 4-cup glass measuring cup! I want to make this soon, but I’ll need to bring it to your house so it’ll get eaten! Let’s bake it at the crawfish boil on Mother’s Day. How about that? No dewberries close around here, but I know where to get blackberries when they ripen and intend to give this a try. This is real cobbler – bet it would be good with some of our Texas peaches, too! Yes, ma’am, peaches would work, too! That looks so good! I came back from Vegas with what I thought was food poisoning and it turns out it’s my gall bladder. I’m on liquid diet until I can get it taken out, which is soon I hope because I’m headed to Dallas next week for more training. Oh, the dreaded gall bladder attack. Honey, I don’t envy you. Did they do that radioactive dye test to determine this? I’ll be thinking of you . . . keep us posted . . . .
MrsCoach, I feel for you with the gall bladder. Been there, done that and in Dallas. Hey, you’ll be about 1/2 hour away when you get there. Mom told me this am that she spent yesterday morning and part of yesterday evening picking dewberries! She said she only picked about 5 gallons this time though because she got tired fast. I would have been way out of it before I got that many!! She will have them all canned by now I bet. OH MY GOSH!! FIVE GALLONS? Gall bladder. eek. My brother had bilateral kidney stones one week then a blocked bile duct then recovering from that had emergency traditional gall bladder surgery. Not his month. We used to have a 2 acre blackberry patch best part was the box turtles that swarmed it when they got ripe. Happy Mom’s day too. I forgot. 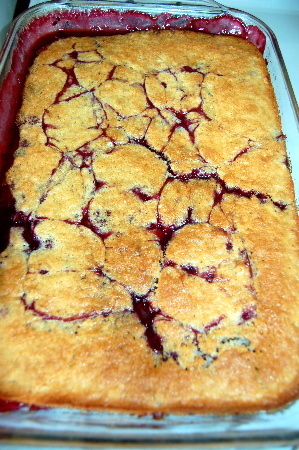 Thanks for picking those juicy little dewberries, bringing them down the bayou, and baking a delicious cobbler! Oh, and I’m so glad you remembered the vanilla ice cream! It was mouthwatering! Oh, and so sorry to BigSis, because there is not enough left to take to her house tomorrow. It was SOOOOOO good! I didn’t know it was so easy, but now I do! Maybe there will be enough berries to make just one more before the birds get them all. My favorite thing about it is the tartness of the berries counterbalanced by the sweetness of the vanilla ice cream! Mmmm! “the tartness of the berries counterbalanced by the sweetness of the vanilla ice cream” spoken like a true Alton Brown fan! It is amazingly easy, right? If you don’t have enough, you can add either fresh blackberries from the produce section or frozen section of the grocery store. Saw some fresh at TortureMart (eeegads) yesterday for $3. HAPPY MOTHERS DAY TO BW AND ALL THE REST OF THE MOMS. Hope it is all you could wish for. Thanks guys for the concern—now I’ve got pancreatitis on top of the gall bladder issues. Guess I’ll be going to Dallas for training with an inflammed pancreas and an unhappy gall bladder, lol. Good! I hope D. and the boys enjoy it. We love it! Seeds and all! i am 62 years old and my mom used this recipe when i was a child. sometime she use peaches or apples. she always call it a lazy cobbler. Lazy cobbler. I like that!! All mixed up and in the oven! Was it good? Did you put ice cream on top?? Yum!